Today was Opening Day at Six Flags. 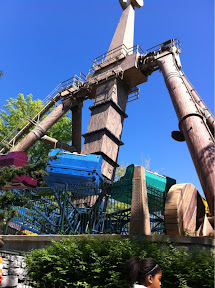 Luke is going to be three years old shortly and needed a season pass like Mom, Alyce, and myself. The downside of that besides the cost was that he needed his picture taken, just like everyone else in the park. The line for Season Pass Processing stretched all the way to Terre Haute. I stood in line most of the time. Towards the end of the line the rest of the family joined me. 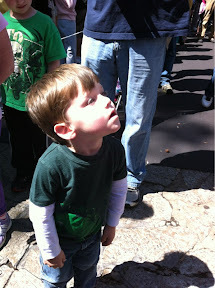 While standing and waiting Luke was in awe of the Excaliber ride going through its cycle. It kept his attention long enough to snap a set of pictures. I think Luke is going to be the Amusement Park Rider of the family. He is enamored with roller coasters and is pretty much fearless.